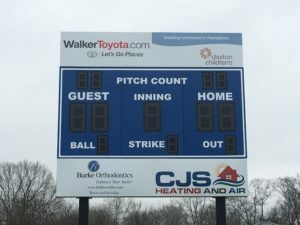 New Scoreboards for Springboro Park (OH)! 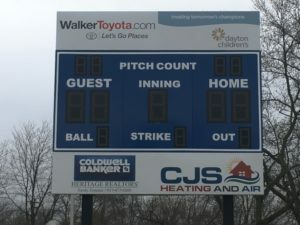 We are thrilled with the completed scoreboards we were able to provide Springboro Park! Thanks to the City of Springboro, Springboro Community Park and our proud sponsors for joining us in the effort to bring the new equipment to the community. 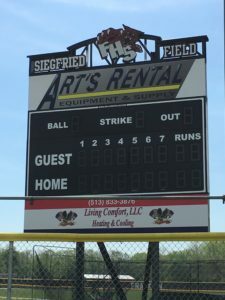 The scoreboards look great and we look forward to helping Springboro for years to come! 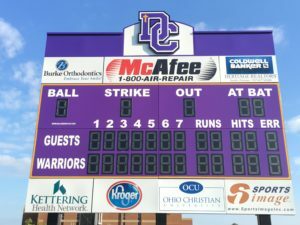 We are continuing to secure sponsors for the Dayton Christian HS (OH) scoreboard and it’s looking great! We love connecting sponsors with schools and look forward to helping Dayton Christian for years to come! Academy of Holy Angels (MN) Receives $5,000! We are thrilled to be sending a check for over $5,000 to Academy of Holy Angels (MN)! This check serves as a result of our revenue sharing program with the school and an ongoing effort to provide Academy of Holy Angels with revenue for their athletics. We wish them the best of luck in their upcoming season! We are thrilled to send Athletes in Action (Xenia, OH), a check for close to $9,000 toward their growing sports complex! This is the first of many more checks to come with our partnership as the marketing agency for AIA, and we are eager to help them make great changes in the community and across the nation! Pennsville Memorial HS (NJ) is continuing to enjoy the benefits of our revenue sharing program with another check on the way. We are happy to be sending $1,000 to the school, and look forward to continuing to pump revenue into their athletic department in the future! 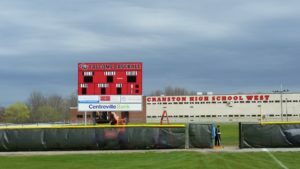 We are thrilled to provide Cranston West High School (RI) with a brand new baseball scoreboard! 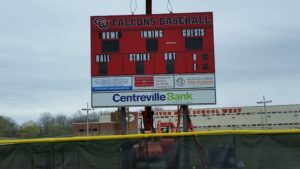 The board comes as a result of our local marketing efforts and proud sponsors – and the school cannot wait to put their equipment to use. This is why we do what we do at Sports Image®. We are proud to present Pennsville High School (NJ) with a $6,000 check toward their athletic program. More revenue sharing is on the way for the school and we are eager to continue taking the PAY out of PLAY for Pennsville! Sports Image® is happy to provide Milton Union High School (OH) with a check for about $1,200 toward their athletic department. These funds will help pump up their athletic program and offset the cost of youth sports. We love to take the PAY out of PLAY!